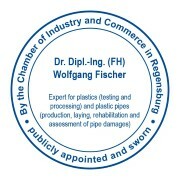 Due to our many years of experience and high professional competence, we wer are by the German and Austrian Government appointed experts for plastic pipes (production, laying, rehabilitation and assessment of pipe damage). The public order is the only government award of highly qualified experts by the state. As experts we are looking at and analyzing pipe damages from all materials. Our special interest is in plastic pipes, since the damage can be particularly complex and the damage assessment requires a deeper understanding of the material and mechanical details of plastics. As experts we assess all damages, especially in the area of ​​connections by plugging, crimping and welding. We create life-cycle forecasts for pipes and perform all types of tests for pipes. In addition to our activities in the field of sewer and water pipes, we are also active as experts and experts for local and district heating pipes, where we focus on the foam and the plastic coating of the steel and plastic pipes.